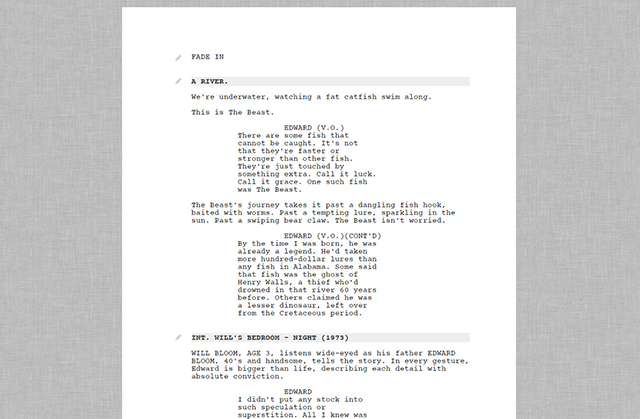 The most enjoyable screenwriting software you'll ever use. Why settle for expensive screenwriting software built on old technology? 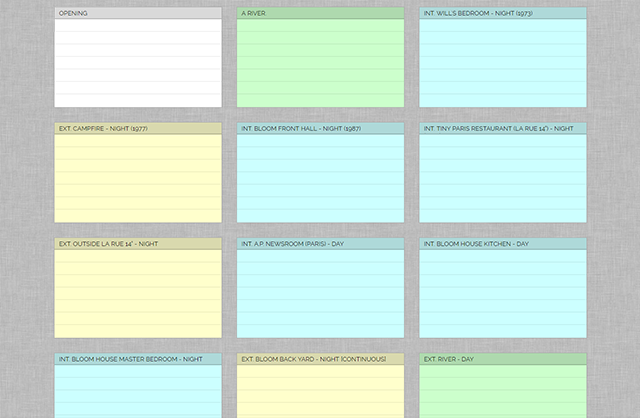 Why muddle around in production planning tools when all you want to do is write? Scriptworthy is smart, secure, distraction-free, and impossibly easy to use. Sign up and start writing now! Stay focused with a clean, uncluttered writing space. John August's screenplay for "Big Fish" imported from Final Draft and ready to edit in Scriptworthy. Arrange, suppress, annotate, and color code your scenes. Spend less time clicking menus and toggling element types. Scriptworthy runs in your web browser, so you can access it from anywhere. Finally, a screenwriting app that gets dual dialogue right! Create alternate versions of any scene and swap them in and out of your script. Character, location, and story analytics tracked in real time. Upload custom screenplay icons, character imagery, etc. Share your screenplays online and password-protect them if you like. Output scripts tailored perfectly to strict industry standards. Import from Final Draft; Export to Final Draft, Fountain, and PDF. 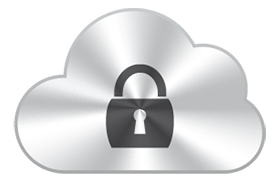 Client-side encryption, server-side obfuscation, redundant daily backups, and crash-proof cloud storage. Unlimited projects, auto-saving as you write, character auto-completion, typewriter mode, Courier Prime font, always-on encryption, 100% ad-free, and 24/7 support. Scriptworthy is powered by a growing team of screenwriting pros, code jockeys, designers, and usability experts in Los Angeles, California. Say hello. We're nice! Get started. No credit card required. No obligation. If you choose to upgrade after the free trial period, Scriptworthy is just $9 per month or $99 per year. Cancel any time!
! Your password will be sent to this address. Forget your password? Enter your username above and click here.